I am turning right around to head out on another travel adventure. This time it’s Potsdam, Germany and Innsbruck, Austria with my sister Barbara. You know what that means—prepare my smallest tapestry frame for travel weaving. 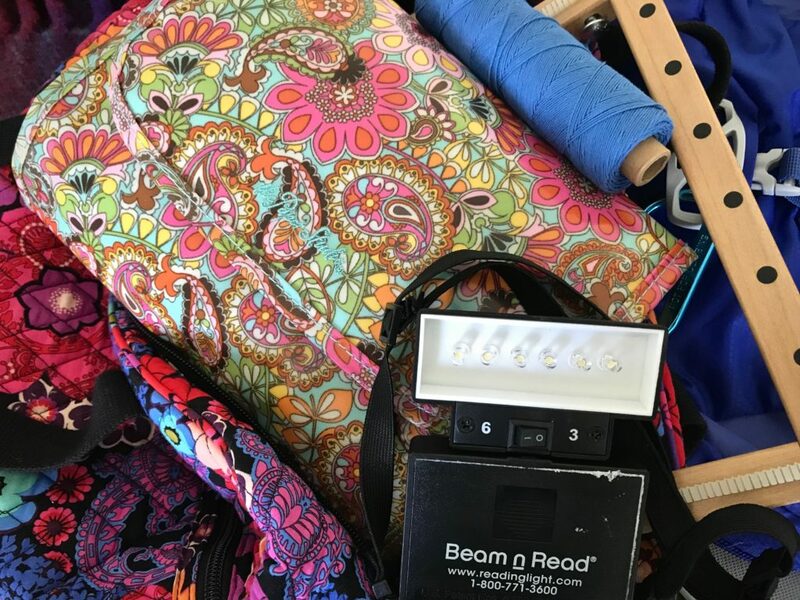 Besides the loom, I need necessary tools, warp thread, weft yarn, a cartoon, extra paper and pencil, book light and extra batteries, and a small bag in which to carry it all. Fresno Canyon in Big Bend Ranch State Park is breathtaking. Steve captured the awe last week with his Canon Rebel T3i Digital SLR camera. My dream now is to capture the view in yarn. I am making a cartoon directly from a black-and-white print of the photograph. 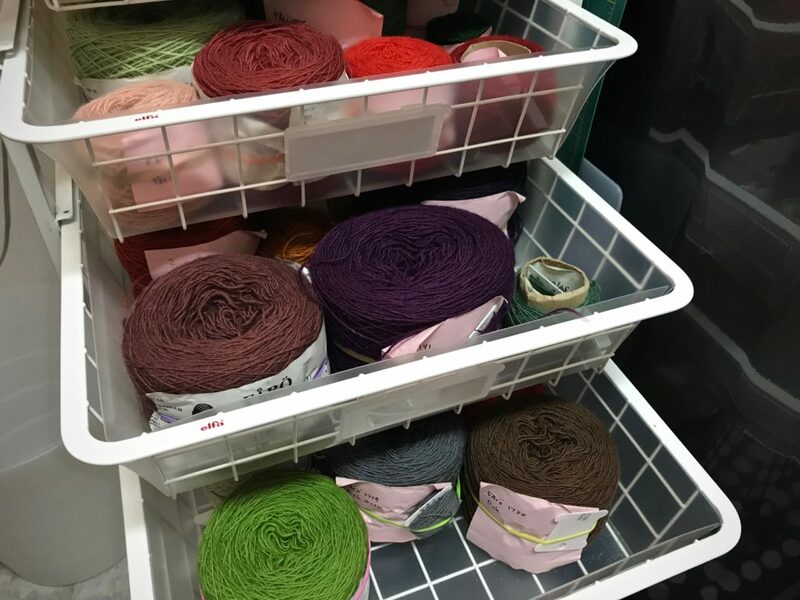 My Fårö yarn is housed in three baskets of an Elfa cart. 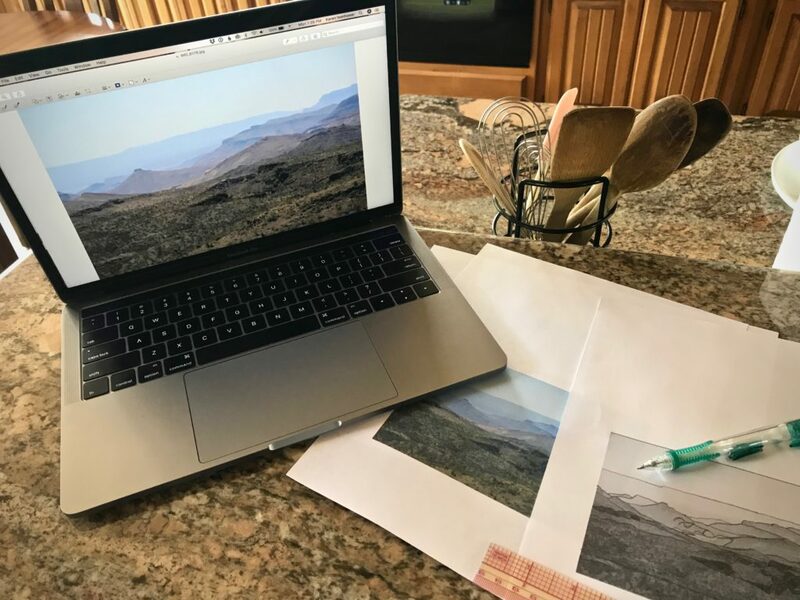 I look at a photo image of Fresno Canyon on my iPhone to select colors to use for the tapestry. 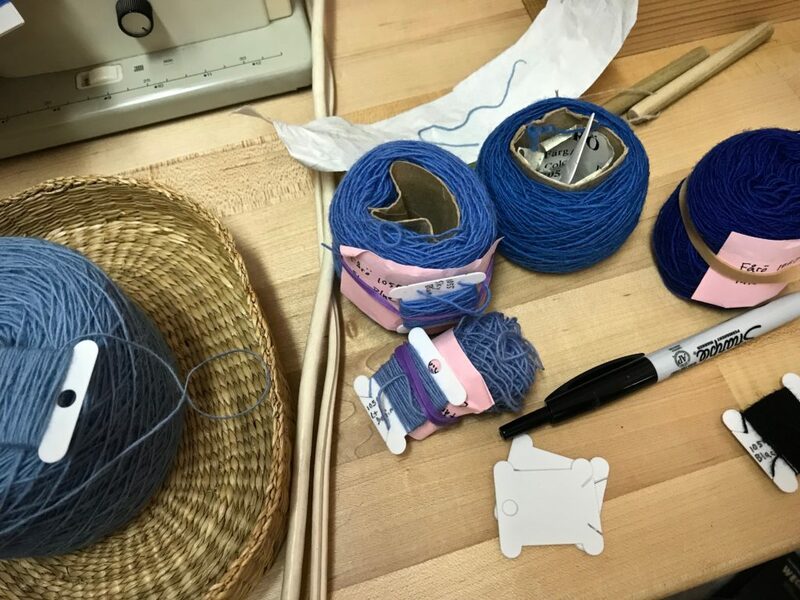 Selected colors of yarn are wrapped on labelled embroidery floss bobbins to put in the travel tapestry bag. 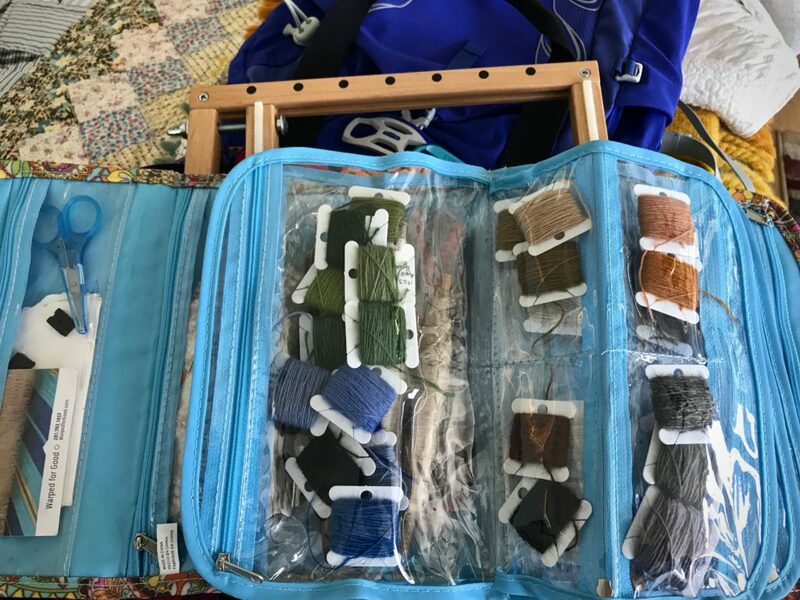 Weft colors are sorted and placed in the plastic pockets of this craft holder I found at Hobby Lobby. Everything needed for a little 3 1/2″ x 6″ desert vista tapestry is being tucked away in travel bags. After that, I can pack my clothes, etc. First things first. May your adventures be memorable. Basis my family heritage of polka bands and German cooks… Your trip will leave little time for weaving once you touch down. I ALWAYS pack my crafting first, weaving and knitting. Then my clothes. It’s fun to know you think the same way. I know you will have a lovely time. Everyone I know who has traveled to Germany and Austria have shared they are absolutely delightful places to visit, especially the small villages in the mountains. Enjoy! Wow, what a wonderful trip and wonderful photo to weave! We go to Germany next year. Enjoy! I hope you have a wonderful time!! My small tapestry isn’t following a cartoon. This time, I am making it up as I go. It’s an exercise in spontaneity, which is good for someone who is most comfortable when she knows exactly what comes next. 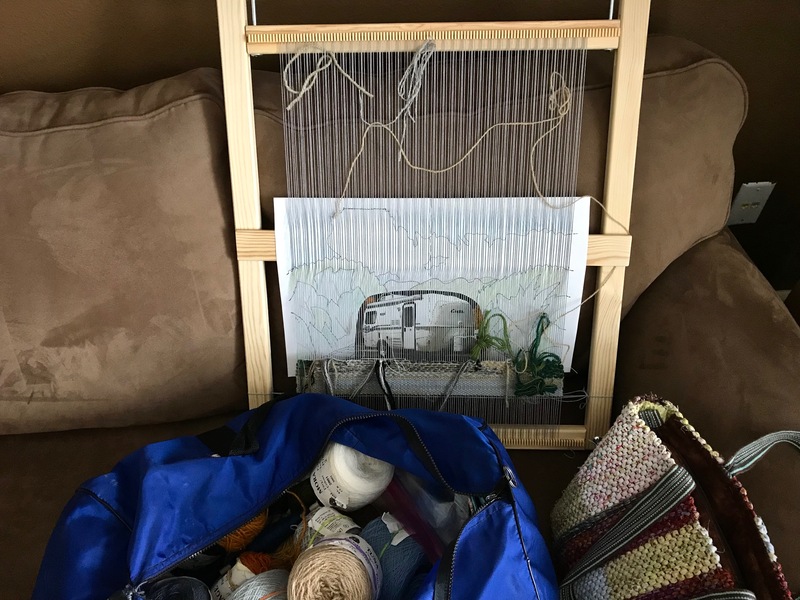 I know enough of the fundamentals of tapestry weaving that I can “wing it.” It also helps that I have enough past mistakes in my experience to have learned a few things. Think of this improvisation as another dimension of practice. A challenge that turns into a learning experience. I have much to learn, so I’m thankful for the experience. Small frame-loom tapestry. Fåro wool weft, 12/6 cotton warp. Sometimes life’s turns give us some weaving to do without a comfortable cartoon to follow. We make it up as we go. An exercise in spontaneity? Yes. Even in this, though, we see the improvised design emerge. Give thanks. The Grand Weaver who taught you how to get this far has your learning experience in mind when He brings you to another challenge. Knowing we have much to learn, let’s give Him thanks! Nice tapestry. I love free form weaving. What loom is that that you are using. Pretty cute. Hi Laura, This loom is one my husband made for me, for travel. It is similar to the Glimåkra Freja tapestry frames. Hi Betsy, Thank you! I hope you have a wonderful Thanksgiving week. What pretty colors to work with thanksgiving week. Hi Nannette, Yes, these colors fit right in with the season. Your message is beautiful and always needed. Hi Loyanne, It’s a good time to be reminded of all the grace we’ve been given. Hi Kelly, Have fun with your tapestry! It’s a great way to keep your hands busy. Thank you! Happy Thanksgiving to you and yours! This is the moment we’ve been waiting for! We finally get to see the whole tapestry. This lizard has given me quite a ride! I have learned plenty. Things I’m happy with myself about, like drawing a cartoon from a photograph, following the cartoon details, making and keeping track of butterflies. And some things I’d like to improve, like choosing colors that give the best contrast, managing the cartoon under the tapestry, and choosing where to pick the floats. I’m eager to do four-shaft tapestry again so I can learn some more! I wove the fringe into an edging, ending with a small braid. Next, I will tack the edging and braids to the back, clip weft tails on the back, and sew on a backing fabric. 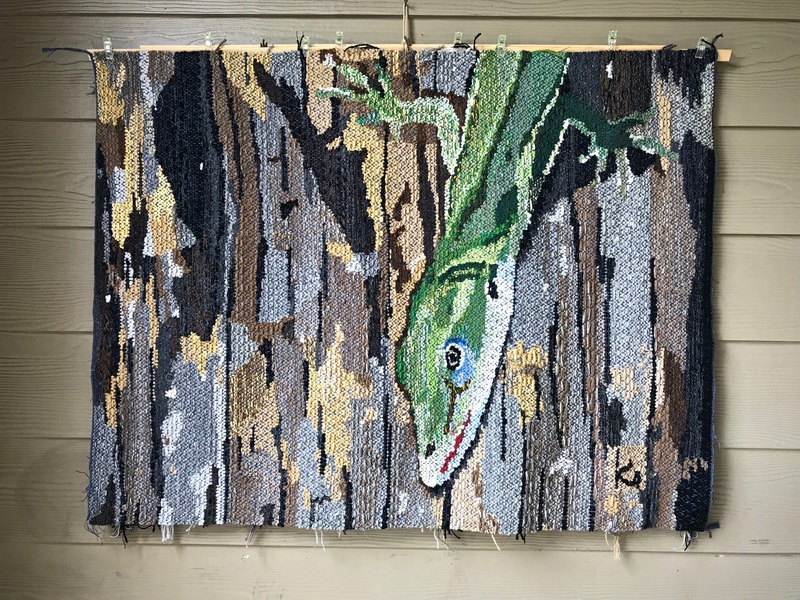 And then, I’ll find a special place to hang this Lizard tapestry in our Texas hill country home, just a half mile from the place I saw and photographed the cute little green anole in the first place. Lizard Tapestry. Next steps are clipping weft tails on the back, adding a backing, and hanging in our Texas hill country home. May your learning experiences take you for an exciting ride. With Steve’s approaching retirement, I am implementing some adjustments for Warped for Good. Friday posts will become less frequent, and by December you will receive new posts only on Tuesdays. Today is my final Quiet Friday post, something I’ve enjoyed doing once a month for the five and-a-half years Warped for Good has been active. 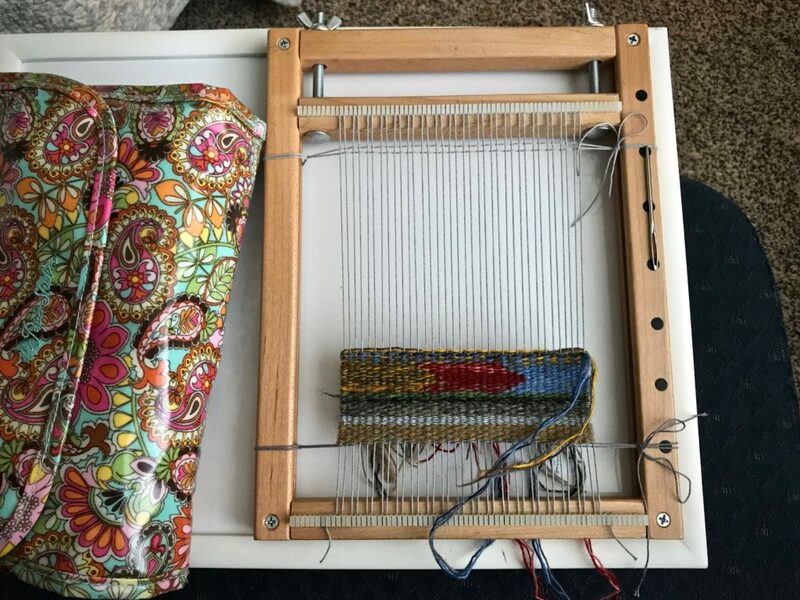 I invite you to continue joining with me on this weaving journey at Warped for Good! The lizard is wonderful! It will be right at home in the Texas hill country. I’m happy for Steve and you! I have so enjoyed your bi-weekly posts as they bring bright spots to my mornings and will continue looking forward to weekly posts. Hi Beth, Your sweet encouragement means so much to me. It’s great having you join with me here! You captured him beautifully! I love that little lizard half smile. We see them a lot on our deck, and on the tree that grows just a few feet from the patio door. I will miss the second weekly posts, but hope you and Steve enjoy retirement as much as we do. I’m glad to hear you enjoy the retirement season. I think we have a lot to look forward to. This is so inspiring. I have never even thought of doing tapestry on my big loom! Love it! How long did it take you? Looks like a LOT of work! Hi Robin, This was on the loom for five months. Part of that time, though, we had a lot of disruptions, including moving to a new location. You’re right, it was a lot of work. But I really enjoyed the whole process! Hi Nannette, It was fun to look at the cute little guy all the while I was weaving. Wishing you all the best in retirement with blessings surrounding both of you. .I have enjoyed the bi-weekly “warping” and learned a lot from you. Never knew that a tapestry could be done on the loom as you shared with us. The lizard will give color and joy wherever he is hung. Will miss you on Friday mornings but look forward to Tuesday’s! Thank you for sharing your knowledge and joy in the weaving of life. God bless! Hi Rachel, Your kind sentiments mean a lot to me! It’s a real pleasure to have you along on this journey. Hi Susie, If I had anything to do with encouraging you to step out of the mold in your weaving, I’m very happy! Oh Karen, he is fabulous, I just love it!! What a long journey the two of you were on! Sorry to see you will be with us only once a week now, but I know you and Steve will be having a great time enjoying retirement now!! Hi Liberty, This was on the loom longer than I’d like to admit, but I enjoyed every part of it! It’s great to have you on this journey with me. Your little lizard turned out beautifully! What size is the finished piece? Hope we get to see him at the November WOW meeting. Hi D’Anne, I haven’t measured it yet, but on the loom it was about 36” x 48”. I’ll bring it to the meeting next week! Thanks for your sweet encouragement to me! Where did you learn 4 shaft tapestry? I am fascinated! I will also miss your more frequent posting but I do hope you and yours enjoy retirement! Hi Tonya, I have not seen very many examples of four-shaft tapestry like this. I learned it from Joanne Hall, who generously shares her knowledge and experience. Her work is amazing and something I’d like to emulate. I have a long way to go in that regard. Helena Hernmarck is another person I’m aware of who weaves in a similar style. I’ve studied pictures in a book I have of her work. I found one other individual on Instagram from Sweden who has examples of this type of four-shaft tapestry. I’m always on the hunt for this kind of tapestry to observe. Thank you for bringing us along on your lizard tapestry journey! 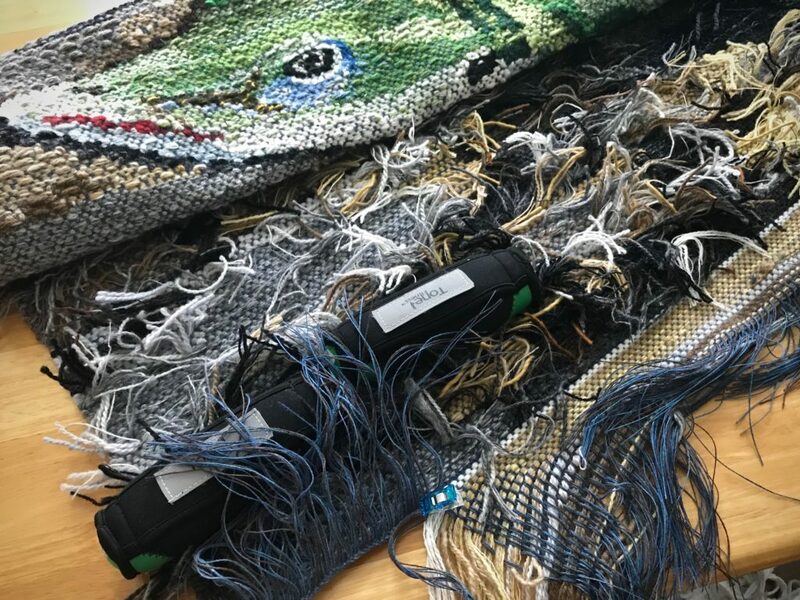 If possible, could you show how you finish it–how close do you trim the tails, how the warp ends are handled, how the backing fabric is attached, how is it hung? Or just say “Look it up in this ___ book,” because we know you are busy going into another season of life! Looking forward to Tuesdays! Hi Lyna, It’s my pleasure to have you come with me on this journey! Everything is better with friends along. I’ll do my best to show the finishing that I do, though I’m still learning that part, too. I did make a little video a while back that shows the method I use to finish the warp ends. You can see it at the end of this post – Quiet Friday: Little Tapestry Diary. It looks wonderful, until I saw your lizard it hadn’t occurred to me that a floor loom could be used for tapestry; one day I might have to try it too. Hi Karen, It was a challenging project! Thanks! Five centimeters is not very far! That’s all that‘s left of this Lizard tapestry. I expect to cut it off in a day or two. What a delight this first attempt at four-shaft tapestry has been! Close to cutting off! The Lizard will soon appear in the completed woven image. Nobody makes a masterpiece on their first try. It takes practice—lots of it. And that’s something I’m eager to do. The experience has been richly satisfying as a weaver. 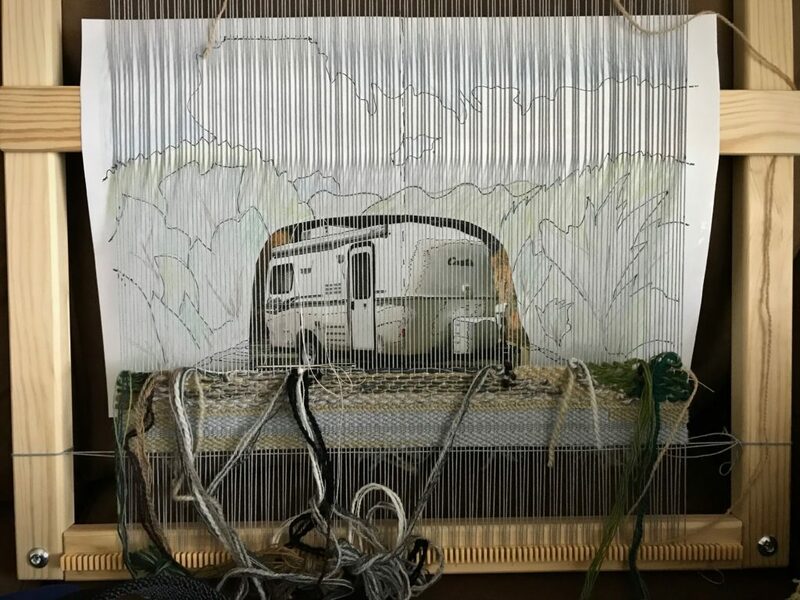 I am invigorated by the challenge of paying attention to a cartoon, and then watching the image grow on the loom. It’s like painting by number, only better. I get to “make” the paint with multiple strands of yarn. Afternoon sun gives an added dimension to the wool tapestry image. Many weft color changes are in the last few centimeters, which keeps it interesting. And I don’t mind the slow pace because I don’t really want the experience to end. We need something to guide us. We need to align our lives with a sure standard of truth, like matching up the image being woven with the center warp end, so we won’t drift off course. Pay attention to the truth. There are persuasive arguments and countless opinions, but isn’t it truth that helps makes sense of reality? God opens our eyes and hearts to see truth. And as we pay attention to truth, and align with it, we get to experience the amazing view of his tapestry being woven all around us. May you know when to pay attention. I have been following this tapestry closely. So very anxious to see the finished work of art. Hi Susie, I’m holding my breath, too, as I reach the end of the weaving. Cutting off is next!! Thank you for your weaving words. May your day be blessed. Hi Margaret, I’m glad these words meant something to you. Can you explain briefly how the multiple shafts work in creating this tapestry? When I think of tapestry, I think of Navajo weaving, which is essentially plain weave. 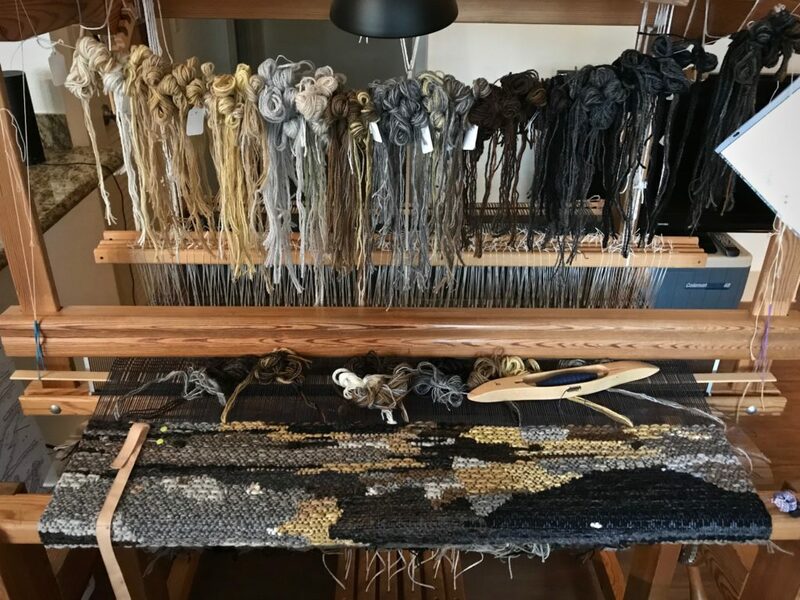 How do the different sheds available on a 4-shaft loom work on a tapestry? Hi Marjorie, Most tapestry is woven on two shafts. 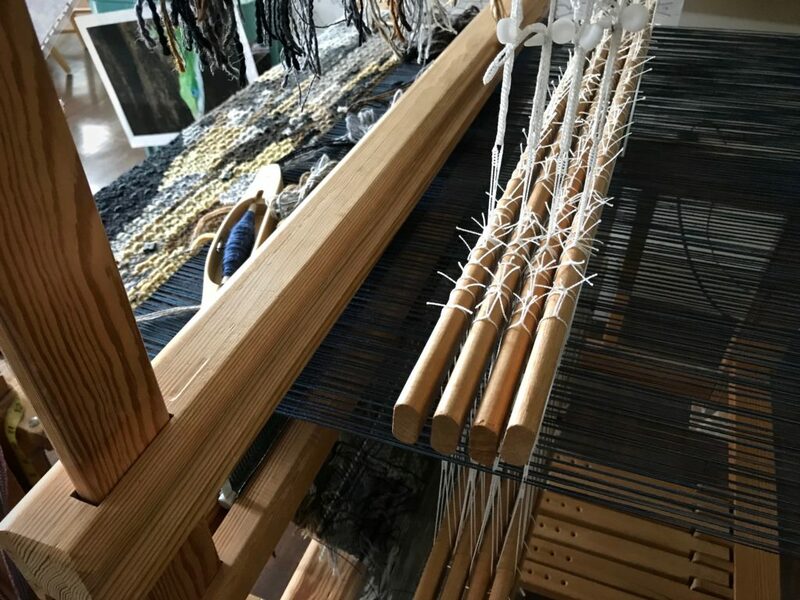 With four shafts I can thread the loom for plain weave and a rosepath or twill threading, and then I have plain weave and a patterned weave for the tapestry. This Lizard tapestry has a rosepath threading. I became interested in this type of tapestry after seeing some of Joanne Hall’s tapestries, and pictures of Helena Hernmarck’s tapestries. This is a new endeavor for me, so I’m still learning how it all works (or should work). I’m so excited to see it!! Hi Liberty, So am I! It won’t be long! One reason I am making friends with this large Freja tapestry frame is Steve’s quickly advancing retirement date. The day after his final work day we are picking up La Perlita, our new Casita travel trailer. We are looking forward to some fun times. Steve will have his carving knives for whittling. And I’ll have my loom. And yarn. What more could we ask for? 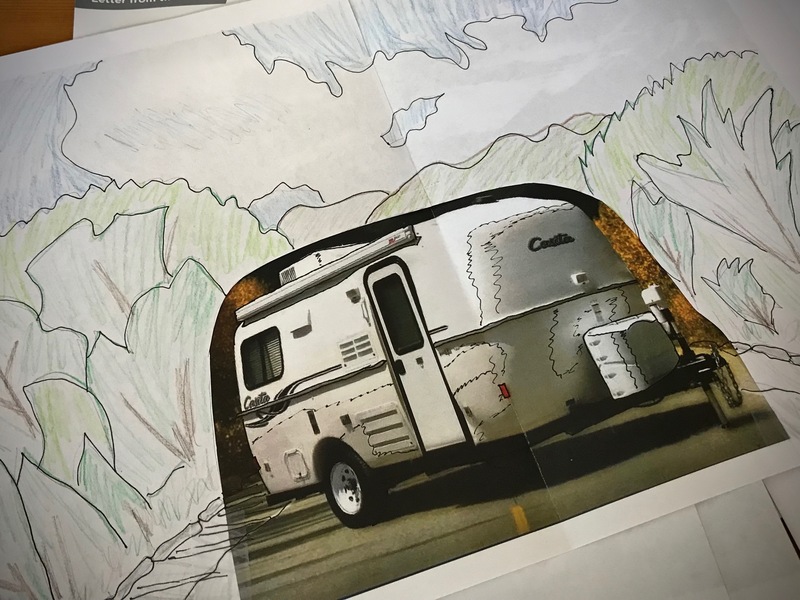 For the cartoon, I enlarged the picture from the Casita brochure, and then drew my own background around it. Home again, after staying with and playing with my young grandsons. The weaving represents a week’s worth of naps. 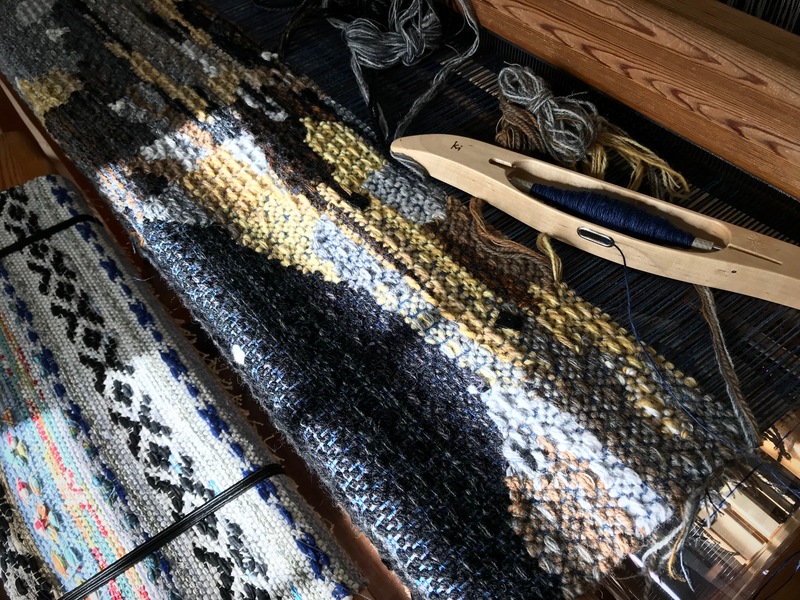 Using technique similar to the four-shaft tapestry on my Glimakra Ideal loom. This gives me a chance to add more depth and texture to the tapestry image. With this technique, some warp does show. May you have something to look forward to. Hi Nannette, Thanks. I believe we will! I live in an RV with a floor loom, a table loom, and multiple small looms, and I love it. Travel mercies. Hi RW, Wow, I don’t know how you do it! Sounds like fun. Looks like you have many adventures ahead. What fun! I’m looking forward to seeing how this tapestry turns out. Is the lizard one completed? Are you familiar with the tapestry artist Helena Hernmarck? She has done some incredible work and she works on a Glimakra loom. Hi Betsy, I don’t know how this tapestry will turn out, but it sure is fun to weave! The lizard is still on the loom. I might possibly complete it this week…maybe? And then I have a bit more warp on the loom for a little more play before cutting off. Can’t wait to see the finished project. Hi Cynthia, We are headed into the great unknown adventure-land. Haha! We have a lot to look forward to. Hi Emily, Thank you so much! That means a lot to me.